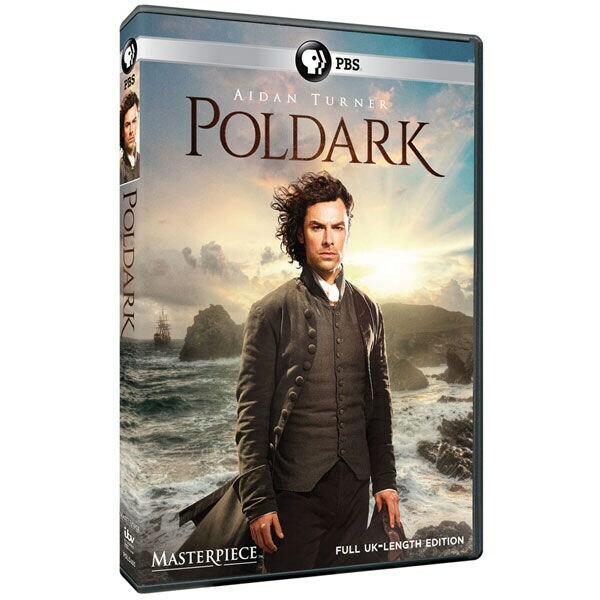 Ross Poldark rides again in a new adaptation of the hit series that helped launch Masterpiece Theatre in the 1970s. Impossibly handsome Aidan Turner (The Hobbit) stars as the redcoat captain who returns to Cornwall after the American Revolution to find his father dead, his inheritance in ruins, and his former fiancee engaged to another man. Based on the novels by Winston Graham, seen on PBS, the remake drew millions of viewers in the UK. Eleanor Tomlinson (Death Comes to Pemberley) is Poldark's new love, Demelza. 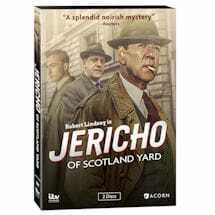 8 episodes, 8 hrs, 3 DVD or Blu-ray discs, SDH. We regret we cannot ship Poldark Season 1 to Canada. Item can only be shipped within the Continental US. Ross Poldark, a British veteran of the American War of Independence, travelling home to Cornwall, discovers his father has died. 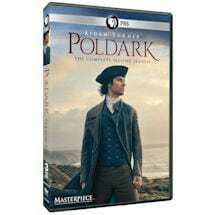 He calls at his uncle's home to discover his inheritance in ruins and his sweetheart Elizabeth betrothed to another - his cousin Francis Poldark. Having sold some of his family's possessions, he goes to market and comes across an urchin, Demelza Carne, being attacked by ruffians who want to steal her dog. Demelza has left home after being beaten by her father. 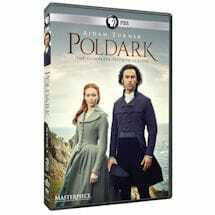 Ross's uncle tries to persuade him to leave Cornwall; Ross becomes more determined to stay and work his inheritance. Bailiffs are closing mines, putting hundreds out of work. Ross hopes to go into business with Francis to reopen a mine; but Francis declines after tensions between him, his wife Elizabeth and Ross are fanned by business rival George Warleggan. Ross manages to obtain finance for his mine from other businessmen. At a dance, Ross's spinster cousin, Verity, falls in love with disgraced sea captain, Captain Blamey. Ross assists her to meet Blamey secretly, against her father's wishes, leading to a duel between Francis and Blamey. When Francis is wounded, Elizabeth announces that she is pregnant. Ross opens his mine and the search begins for a vein of copper. Elizabeth bears a baby son, but her relationship with her husband deteriorates. Young employee Jim Carter whom Ross helped when his girlfriend was pregnant continues to poach pheasants after they are married, and is caught red-handed; transportation is the punishment and Ross's pleas for leniency result in two years imprisonment when he had hoped for aquittal. Rumours circulate as to Ross and Demelza's relationship, and her father, now a reformed character, demands that she returns home. Ross and Demelza become lovers. Feeling in an impossible position, Demelza decides to return to her family, but Ross goes after her, and they marry. The gentry and locals are shocked by the marriage of Ross and Demelza; his judgment is questioned when he seeks more finance from his shareholders for his mine. 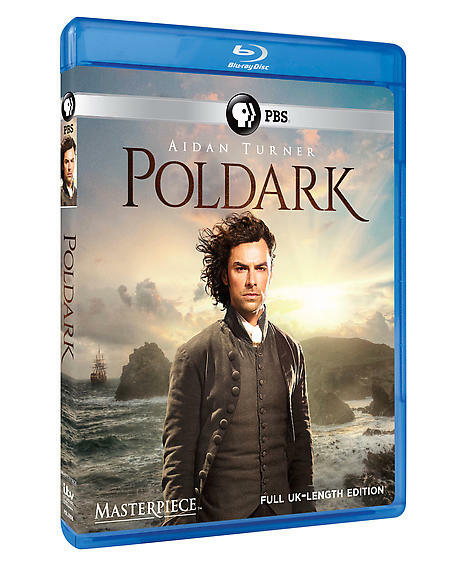 Charles Poldark has a heart attack, and on his deathbed asks Ross to look after his family, realizing that Francis is not cut out for business. 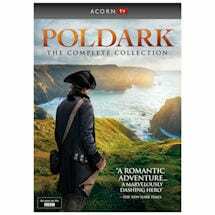 Verity, still pining for Captain Blamey, comes to stay, and teaches Demelza the finer points of society, so that she is able to make a good impression when she and Ross are invited for Christmas to Francis and Elizabeth's home. The occasion, initially strained, is spoiled by the arrival of the uninvited Warleggans. Copper is finally discovered in the mine and Demelza announces to Ross she is pregnant; Ross finally tells her that he loves her. Ross's friend Doctor Enys arrives to study lung disease in miners. Demelza gives birth to a girl. George Warleggan buys shares in Ross's mine. Low copper prices from the smelting companies force the mine owners to secretly organize their own smelting company with Ross in charge. Demelza tries to organize a reunion between Verity and Captain Blamey. Mark, one of Ross's workers, falls in love with a travelling player, Keren, who has expectations that outweigh his means. Francis, deep in debt from his mismanagement of the mine, gambling, and spending on prostitute Margaret, finally gambles his mine. He loses, forcing its closure. Mark's new wife, Keren, sets her sights on Dr Enys. Deadly jail pestilence sweeps Bodmin Jail, and Ross and Dr Enys illegally remove Jim Carter to unsuccessfully treat his fever. The Warleggans hold a ball at which Demelza blossoms while a drunken Ross becomes involved in a card game with the judge who incarcerated Jim Carter and the gambler who took Francis's mine. Verity is horrified when Captain Blamey also attends the party, and she is forbidden to see him again. George Warleggan discovers where the mine owners have been secretly smelting their copper. Verity elopes with Captain Blamey and Francis blames Ross. George Warleggan, seeking to undermine Ross's smelting operation, returns some of the money Francis was cheated out of when gambling with Warleggan's cousin. In return, Francis gives George the identities of Ross' partners, most of whom owe money to the Warleggans, and George then calls in their debts. Dr Enys is seduced by Kerren, who is then confronted by a distraught Mark about her infidelity, with tragic consequences. After learning of Francis' anger towards Ross, Demelza confesses her part in Verity's elopement, and Ross realises how Warleggan has gained the information to bankrupt his business partners. Warleggen's plan to close Ross's smelting company comes to fruition when the company is outbid for the available copper. George Warleggen celebrates by buying a ship. An epidemic of putrid throat strikes down peasant and gentry alike including Francis, Elizabeth, and their son. Demelza goes to their aid and she and her own baby, Julia, succumb to the disease resulting in the girl's death. Warleggen's ship is wrecked off Ross's land and starving mineworkers descend on the ship, with Ross's connivance, to take food and plunder the cargo. Ross rescues the surviving passengers and crew and takes them to his home. George's cousin Matthew died in the wreck and Ross is arrested for murder and wrecking. Aidan Turner, Eleanor Tomlinson, Heida Reed, Jack Farthing, Kyle Soller, Warren Clarke, Phil Davis, Beatie Edney, Ruby Bentall, Richard Harrington, Robin Ellis, Luke Norris.